Located in the heart of central Connecticut's world-class aerospace alley, Aqua Blasting is the one stop shop for all your metal surface treatment needs. We are a service oriented company with a forty-year long track record of growth and success in our industry. 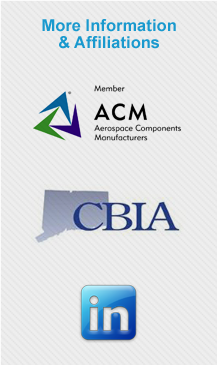 We are also a member of the Aerospace Components Manufacturers (ACM), a consortium of Connecticut-based aerospace companies dedicated to producing components of the highest quality, on time, and at competitive prices. Another of our professional affiliations is the Connecticut Business and Industry Association (CBIA), the largest business association in the state. Our mission is to build a close working relationship with each of our customers and to achieve excellence in all of our endeavors. As a demonstration of our ongoing commitment to quality and engineered processes, we have earned numerous aerospace and quality management certifications, including Nadcap AC7004. We are also certified as an FAA Repair Station (QUGR412L) and are licensed by the United States ATF, holding a Federal Firearms License. Decades of aerospace experience have helped us to earn numerous process approvals from our large customer base. Our well-equipped facility houses a wide array of automated and specialized equipment, giving us the ability to process parts as small as one inch to over twenty feet in length. We maintain a company philosophy of continuous improvement and work closely with our customers and their associated contractors to achieve excellence in all the work we perform. What sets us apart from other surface treatment providers is our outstanding Customer Service and a pledge to meet or exceed our customer expectations with every part we process. Our pricing is competitive and we earn our customer's repeat business by consistently maintaining high quality, personal service, and on-time delivery on every order. We are equipped to handle short duration, small production runs ranging from one to fifty pieces as well as long-term, high volume runs up to 15,000 pieces.